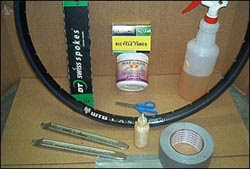 You can convert virtually any mountain bike tire to tubeless using this system regardless of the tire being new or used. The lighter the tire casing, the easier it will be to mount, but the more it will leak initially and the more frequently you will need to top up the air pressure. Tires with large holes or cuts in the casing should be repaired first or not used.